A man was at the theatre. He was sitting behind two women whose continuous chatter became more than he could bear. Leaning forward, he tapped one of them on the shoulder. - Pardon me, madam, - he said, - but I can’t hear. -You’re not supposed to, that is a private conversation, - she hit back. In the theatre Father brought Tommy into a large room. There were mirrors on the walls of this room and small tables under them. Many people were sitting there and … making their faces dirty! Father also put something on his face and hands, and they became black. Tommy had never seen such a dirty face in his life. Then Tommy heard music. Father told him to stay in the room and wait, and everybody left the room. Now Tommy was alone in the large room. He had nothing to do. For some time he wandered about the room, looking at himself in the mirrors. Then he felt lonely. He wanted to find his father. He opened the door and went out into the corridor. There was nobody there. Far away he heard his father’s voice. He went along the corridor. At the end of the corridor there was a door. Tommy pushed it and found himself in a very large room. Now he could hear his father better. His voice was coming from behind the wall. The wall was made of fabric, and near the floor there was a little hole in the wall. Tommy looked through this hole. He saw a very large and beautiful, well-lighted room. There was somebody in the room, but through the little hole Tommy could not see who it was. He pulled the fabric, and the hole became larger. Now he could push his face through it. The stage manager was sitting in the box and watching the play. He had a very good view of the stage. He was satisfied. Everything went well. An all-star cast was playing. The scenery was first class. The acting was excellent. Othello was magnificent, more magnificent tonight than ever. Desdemona was brilliant beyond all doubts. The play was surely a success with the public. The stalls, the boxes, the dress-circle, the tiers, even the gallery, were full of spectators. It was still in the hall: the public were watching the play with bated breath. Suddenly the stage manager saw that there was a face in the fireplace. Little Tommy smiled happily but did not move. Othello, who did not know what to do, went back to Desdemona. Little Tommy could not see his father now, so he moved a little and came out of the fireplace. He quietly walked to a small bench which stood near Desdemona’s chair, and sat down. The spectators were laughing. Othello tried to save the situation. Imitating the manner of Shakespearean characters, he said to Tommy: “You go, my son, and leave us here alone.” Desdemona, trying to help Othello, said: “My boy, you go home. Your mother is waiting for you.” Tommy liked it very much! It was like a song. And he sang: “I don’t want to go home. Mother is not at home. She is on a business trip in another town.” The spectators were roaring with laughter. What could poor Othello do? He came up to the boy, took him by the hand and went to the door. In a minute he came back without the boy. The play went on. Little Tommy was sitting in the large room with mirrors. He was crying. He did not understand why his father was angry with him. 1. Tommy went to the theatre for the first time when he was six. 2. Tommy’s father was an artistic director. 3. 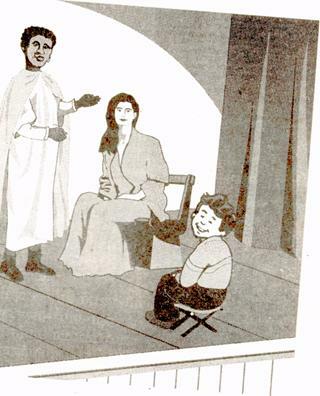 There was nobody in the house to leave the boy with, because Tommy’s mother was in the hospital. 4. Father put nothing on his face and hands. He was to play Othello. 5. The stage manager was sitting in the box and watching the play. 6. The stage manager had a weak heart, that’s why he felt so bad and could not move when he saw Tommy in fireplace. 7. The people who were sitting in the hall did not see Tommy in the fireplace. 8. Tommy couldn’t see his father, that’s why he walked to a small bench which stood near Desdemona’s chair. 9. Othello came up to the boy, took him by hand and went to the doctor.  Have you got any seats for tomorrow?  Matinee or evening performance?  Matinee, please. I want two stalls if you’ve got any.  Yes, you can have two in the middle of row F.
 Thank you, I think they’ll do very well. How much are they?  Twelve and six each — that’s twen­ty-five shillings.  Stalls, sir? Stalls on the right. Gen­tlemen’s cloakroom this way; ladies cloak­room on the first landing.  Show your tickets to the attendant inside the theatre, she’ll show you to your seats and let you have a program.  May I see your tickets, please? Ros F 12 and 13. This way, please. Would you like a program?  Yes, please. How much?  Sixpence. Thank you. After the se­cond act there’s an interval of fifteen minutes. 1. Last night Mr. and Mrs. Smith went ... the theatre. When they approached ... the theatre, they saw some people standing ... the entrance, waiting ... their friends. Mr. and Mrs. Smith went ... . First of all they went ... ... the box-office and asked ... two seats ... the dress-circle. But the dress-circle seats were sold ..., and they were of­fered two seats ... the tenth row ... the stalls. Then they went ... the cloak-room and left their coats and hats ... the cloak-room attendant. After that they went ... ... the usher and bought the programme. The usher showed them ... their seats. 2. What’s ... ... the Opera and Ballet House to­night? 3. I am not much ... a theatre-goer. 4. My sister is fond ... ballet. 5. Did you buy tickets ... advance or ... the day ... the performance? 6. They could not get tickets ... the first night ... “Hamlet” ... Smoktunovsky ... the leading part, because the house was sold ... long ... the day ... the performance. 7. This theatre is famous ... its excellent company. 8. I was completely carried ... ... her wonderful acting; it was so true ... life. 9. We are going ... the theatre tomorrow. Would you like to join ... us? 10. The play was a success ... the public. David Garrick was a famous English actor of the 18th century. At the beginning of his stage career he worked in a company of actors which toured the south of England. One summer day the company arrived at a little town. They staged a tragedy based on an episode of the Punic Wars. The evening was warm and they played in an open-air theatre. At the beginning of the second act there was a scene of a battle-field. There were several bodies of dead soldiers lying on the stage. David Garrick played the part of one of these dead bodies. He was lying on the stage and trying hard to look like a real dead body. An actor playing the part of a Roman general came forward and, standing over Garrick, began to recite a monologue. Suddenly Garrick heard a mosquito buzzing near his ear. Then there were two mosquitoes. The next moment several mosquitoes were stinging him in the face and in the leg. Garrick wanted to scratch himself, but he was playing the part of a dead man, so he could not move. He suffered greatly. And just at that moment Garrick, who could not stand the mosquitoes any longer, began scratching himself violently! A: Well, and now that the performance is over, what’s your impression of it? B: Everything is just wonderful! The play itself, the staging, the stage effects, the acting were too marvelous for words. A: You are right, especially the acting – that was simply beyond description. B: You know, at times I completely forgot myself. And what an appreciative audience! Did you ever hear such bursts of applause from spectators every time the curtain went down? A: I’ve never seen an audience applaud so much be­fore. I think there were more than, five curtain calls. I clapped so much that my palms hurt even now. But what are London theatres now? The Covent Garden Theatre is famous for opera and ballet performances. The best English singers, bal­lerinas and ballet dancers are playing there. The National Theatre shows drama. The Aldwych Theatre is famous for its dramatic performances. In provincial towns the system is different. They have a repertory theatre which changes its play about every three weeks, whether it is successful or not. The National and the Royal Shakespeare Theatre (which is situated in Stratford-on-Avon, the place where William Shakespeare was born), also present three or four plays in rotation for several weeks. There is a system of “Club” theatres where you can see both well-known and financially risky experimental plays. A performance is pro­duced both by professionals and amateurs for one or two weeks and any profit from this goes to pay for the next production. Money prob­lems are not important since the actors are paid little or nothing. a) drama; b) opera and ballet performances; c) musicals. a) drama; b) concerts of pop music; c) musicals. a) drama; b) folk songs; c) dramatic performances. c) changes its play twice a year. c) the actors are paid little or nothing. A: Let’s go and buy some lemonade or juice, I like drinking something during an intermission. B: That’s a good idea. I feel thirsty, too. A: Well, Ann, and how do you like the play? B: The acting is perfect, to my mind. Why, it doesn’t seem like acting! Each actor performs his part so realistically, so true to life. A: No wonder. The company of this theatre is really outstanding. Besides, tonight an all-star cast is playing. B: Yes, indeed. I was completely carried away by their acting. A: And the scenery is superb. B: Yes, especially in the first scene of the second act. A: Here is the refreshment room. Let’s drink some grape juice. A: Isn’t that the third bell? The lights are going down, and I think I hear the orchestra tuning up. B: Let’s hurry. That’s our staircase, to the right. I am not sure which aisle is ours. Here’s an usher, she will show us to our seats. I feel thirsty. – Я хочу пить. 1. You and your friend are returning from the theatre and discussing the play you have seen. 2. You have just returned home from the theatre. The members of your family want to hear your impressions. 3. You and your friend are planning to go to the theatre together. Discuss what theatre you want to go to and what performance to see. 4. You are an actor. You have just returned home from the first night of a play in which you have played a part. Share your impressions with the members of your family. 5. You are a senior former dreaming of an actor’s career. Imagine your conversation with a friend of the family who is a stage manager of a theatre. 1. a) Cinema ____ loved the movie. b) Millions of ____ switched on their TV sets to watch the election results. 2. a) The lawyer asked the witness what she could ____ about the accident. b) I’m always forgetting things. I just can’t ____ anything. 3. a) We must stop polluting the ____. b) She grew up in very comfortable ____. 4. a) He’s a very ____ president; I’m sure people will vote for him again. b) When her photo appeared on the front page of all the newspapers, she became ____ overnight. 5. a) The BBC ____ all over the world. b) The film was first ____ at the Cannes Film Festival. 6. a) They live in an old, ____ cottage in the country. b) The ship hit some ____ and sank. Television gained acceptance as a com­munications medium following World War II. Critics claim that the golden age of television occurred in the 1950's. Va­rious fads have swept the television scene — westerns, doctor and lawyer shows, cops-and-robbers series, rural comedies. Sports coverage of baseball, golf and especially professional football is currently in vogue. Late evening talk-shows are cur­rently popular. Recently controversies involving television have concerned children’s programming, the issue of violence, and the right of TV to broadcast controversial news programs. Psychologists have argued that the presentation of violence on television might lead young people to regard violence as acceptable behaviour. TV is a major factor in American life. The British spend a great deal of time watching television. Some people watch one program, and then they are tempted to watch the next one as well, when per­haps they ought to be doing something else. The more intelligent people, how­ever, choose their programs very carefully. They find out what they really want to watch by studying the printed programs, and do not allow themselves to waste too much time watching merely light enter­tainment. Task 1Agree or disagree with the statements. 1. Television gained acceptance as a communications medium following World War II. 2. Critics claim that the golden age of television occurred in the 1970's. 3. Late evening talk-shows, westerns, doctor and lawyer shows, cops-and-rob­bers series, rural comedies have become very popular. 4. Sports coverage of baseball, golf and especially professional football is not broadcast. 5. The issue of violence, and the right of TV to broadcast controversial news prog­rams are very serious problems. 6. TV doesn't play great role in Ameri­can life. 7. The British spend a great deal of time watching television. 1. What is your favourite channel? 2. Are there any commercial networks in the republic of Kazakhstan? 3. Do you know any noncommercial channels in the republic of Kazakhstan? 4. What commercials do you like better Kazakh or foreign? 5. Do you have any cable channels? Choose the phrase that is closest in meaning to the original sentence. Note that several of the choices may be fac­tually correct, but you should choose the one that is the closest restatement of the given sentence. Parents have become increasingly con­cerned about the television viewing habits of their children — so much so that families are beginning to censor the programs that enter their homes. (1) Families watch television together more often now than in the past so that they can decide whether shows are desirable or not. (2) Families with televisions are not as close as families without televisions because the former bicker more over program choices. (3) Although parents worry about the programs that their children watch they find it difficult because censorship is not what it used to be. (4) Because of their concern over the television programs that are aired many parents are deciding which programs they will allow their children to watch. George: Have you just been to the cine­ma? Ken: «Paris in the Spring». George: Oh, I've already seen it. I saw it on a B.B.C. television programme last year. It's an old film, but it's very good. George: I have never been there. Have you ever been there, Ken? Ken: Yes, I have. I was there in April. George: Paris in the spring, eh? Ken: It was spring, but the weather was awful. It rained all the time. George: Just like dear old London! screen take upon himself a most responsible task? 11. How is the cinema used as an aid in teaching? 12. What do you know about international film festivals? How often are Moscow Film Festivals held? What is their motto? Ex 7Read this text quickly. It is about one of the most famous actors of this century. Can you guess who it is? His early life was a time of great hardship. He was born in a very poor part of London, but his family were at first well off enough to afford a maid. However, while he was still a child, his family gradually lost everything. His father was a comedian and his mother worked as a dancer and singer. Neither of them was very successful and the family had very little money. They were so poor that, at one time, he and his brothers had only one pair of shoes between them and they had to take turns wearing them. His father eventually deserted the family and later died of alcoholism. The strain caused by this desertion affected his mother deeply. Her career fell apart and in the end she became insane. When his mother had to go into an asylum, he was sent to an orphanage. The first time he himself earned any money was by dancing and singing when he was only five years old. As a young boy he had many different jobs, but what he loved most of all was working in the theatre. As he said in his autobiography, he felt quite ‘at home’ on the stage, in more ways than one the stage became an escape from the pain of his family life. When he was about 15, he joined a travelling theatre company and went on trips to America. On one such tour he was offered a part in a film, so he went to Hollywood, where eventually he became both an actor and a film director. In his films we see the influence of his early life: a strong feeling of pity for the poor, a romantic view of women (he worshipped his mother) and love of applause. His comedies were immediately successful. As well as making policemen look foolish, he also often used the situation where people find themselves in a ridiculous position, but refuse to admit they have a problem. The best example of this is the drunken man who though obviously drunk in the way he walks and talks, tries to pretend he has not touched a drop. One of his most famous roles is the little tramp who tries but fails to be a gentleman, and so makes us laugh. His films are not always comic; they are often sad and some, like The Great Dictator, contain a strong political message. As a director he was known to be a perfectionist and sometimes made actors repeat a scene many times until he was finally satisfied with it. Many of the people he worked with found him mean and tyrannical, but it was probably his early experiences of poverty that made him so anxious to be successful. He is undoubtedly the most popular comedian of all time. He died in Switzerland in 1977 at the age of 88. There is now a statue of him in London, the city of his birth. His name is ____________________________________________ . d) they were able to make ends meet. d) she became too old. d) that his family worked there. 4. In what way did his early life affect his work in cinema? a) He wanted to make people laugh. b) He made a film about his mother. c) He showed the life of the poor. d) He wanted his films to make money. d) he keeps falling down. 7. What was he like as a director? a) He was difficult to please. b) He was keen to please everyone. c) He was anxious to finish. d) He was never satisfied with his work. 1. What might have caused his father’s alcoholism? 2. How did the film director’s feelings about his mother show in his work? 3. Compare his early life with his life when he became famous and successful. How do you think his lifestyle changed? Task 3Work with a partner. Talk about the things that make you smile or laugh. Do you find any of the following funny? Ex 8Insert necessary words which initial letters are given. 1. Cinema, radio, television and the press are often called the m ____ m ____ . 2. The critics all gave the film extreme­ly good r ____ . 3. The film is based on a best-selling n ____ . 4. I was biting my nails all through the film because it was such an exciting th____ . 5. The story wasn't very good — in other words the film had a weak p ____ . 6. The person who tells the actors in a film what to do is called the d ____ . 7. If you sit right at the front in the cinema, you’ll be too close to the s ____ . 8. In a theatre the most expensive seats are the ones closest to the s____ . 9. He was marvelous in his role and gave an excellent p____ . 10. Between the acts in a play there's usually an i____ . 11. At the end of the play, there was thunderous a____ . 12. The magician asked for two volun­teers from the a____ . 13. A play or TV program which makes you laugh is called а с____ . 14. If you don't like what's on BBC 1, why don't you switch to another ch ____ ? 15. We're a long way from the TV trans­mitter, so we don't get very good r ____ . 16. Collecting stamps and sticking them in an album used to be my favourite h ____ . 17. He hardly ever buys books in a bookshop; instead he borrows them from the 1____ . 18. The person who directs a symphony orchestra is called the с ____ . 19. I enjoy listening to rock music as well as to с____ music. 20. I don't enjoy serious plays at the theatre, I prefer to see a good m ____ . 21. More and more people are buying or renting films to watch at home on v ____ . 22. His books are very readable and I like his style — I think he's a good w ____ . 23. I couldn't stand the hero or the heroine but I really liked the v____ . 24. I've got so much work to do that I don't have any time at all for r____ . 25. When I'm at home. I spend hours on end listening to music on my r____ . 1. Different genres of films, their impact on the spectators. 2. Development of people's cultural level, taste. 3. Films for entertainment and education. 4. Cinema in the classroom (Geography, History, Literature, Foreign Language). 5. Films to instruct: a) in an industry to teach people how to acquire skills, to learn their profession; b) in medicine to show the ac­tion of heart and pulse and other organs, to watch delicate opera­tions being performed by noted surgeons, etc. ; c) in science to see the world of small things, etc. ; d) in sport to give objective judgment during the competition, etc. 2. Skilful directors, modern techniques, the possibilities of the camera to accentuate. 3. The value of experience, necessity to acquire technique. 1. Necessity to look at the character from a distance, to sympa­thize and criticize, to understand him. 2. Practice in reproduction of the character before the audience. 3. Effect achieved: the less actors feel, the firmer their hold upon their facial and bodily expression. 4. A possibility of reaching such a state of mechanical perfec­tion that one's body is absolutely the slave of one's mind. Ex 10Read and translate the text. Up-to-date estimates suggest that by the year 2000 Oprah Winfrey will be worth billion. She is the most successful en­tertainer in the world outside movies and pop music. Ten years after she first took the television world by storm, she has been called «the most famous exponent of audience participation talk shows» and «the most powerful woman in entertain­ment». Oprah is the first woman in television to own and produce her own talk show - and only Mary Pickford and Lucille Ball owned their own studio. With much disappointment all round, she postponed the writing of her much-awaited, ghost-written autobiography partly because of the terrible memories the process aroused in her. But now, in an unofficial biography, one version of the story has been told. Through strength of personality she has made a huge success of herself but not without criticism. Oprah: The Real Story by George Mair lifts the lid on Op­rah and her lifestyle. Now at her happiest after years of struggling with inner de­mons, Oprah is looking thinner and heal­thier than ever. «I used to rule my life based on what other people wanted me to do,» she once admitted. «It's hard to believe. I have this powerful position, but this fear kept mefrom being the person I was born to be. «I was a doormat for many years,» she once said offhandedly. But no longer — she has come far since the days she was brought up by granny on a pig farm in the backwoods of Mississippi. «When I was 14, I had a baby as a result of having been molested, then I became promiscuous and was involved in more molestation. I carried the baby in great shame and horror. My baby died and I thought that was my second chance in life...» she confessed after her sister told the story to the press. Since her success, she has ploughed much of her money into setting up scho­larship programs aimed at disadvantaged kids and has been active in lobbying for changes in the law regarding child abuse. A foundation she established also helps ghetto families. By the age of 32 she had made her first million. Now Oprah is richer and more powerful than she ever dreamed. The price of her success, however, has been vast. She's been criticized for every­thing — for being fat, for being badly dressed, for exploiting her chat show gu­ests and even for being racist. Oprah conducts her seemingly sponta­neous confrontational talk show like a cross between a girls' night out, a religi­ous meeting and a psychotherapy session. Rowdy audiences are whipped into frenzy and relish taking sides. Her output, how­ever, has been seen as over-sensational, trivializing serious issues and profiting on the misery of others. On-screen cap­tions tell you all you need to know about past shows. «Raquelle: killed best friend when driving drunk», «Richard: survived near death experience», «Danny: married girlfriend's mother». Oprah shows enormous empathy with the underdog and especially female audi­ence members but has a tendency to lapse into self-help jargon: «Did you feel res­ponsible because you're an enabler?» she once asked the wife of a habitual drunk driver. Author George Mair questions whether Oprah is a healthy influence and decries her schlock tactics. He cites behavioural health experts who suggest that Oprahand other similar shows do unintentional harm by making relatively rare and unim­portant issues seem common whilst mi­xing laughably exotic topics interviews with serious issues like sexual abuse. There has also been criticism that guest therapists (invariably with a book to peddle) often give all-consuming advice and install diagnoses that are trite or just plain wrong. Oprah's exclusive 1993 interview with Michael Jackson received one of the big­gest audiences in television history. BBC2 recorded its highest ever ratings (around 11m) but the critics savaged her for being too soft on Wacko Jacko. Oprah, who was once billed «the diva of deep dish», recently told Entertain­ment Weekly of a major change in direc­tion. Recently she has to battle ratings with younger, livelier hosts. She was also stung by friends and critics who disliked the sleazy aspect of many of her shows, andhas recently concentrated on more caring and uplifting content. There's talk, too, that in the future, Oprah will devote more time to produc­ing, directing and starring in movies ba­sed on the novels of celebrated black wri­ters such as Toni Morrison. «I want to stand for something of value,» says the deep dish diva. f) Ophra is not content with her present work wants to change something in her programs. Ex 11Read the critical essay about the film. Answer the questions. Do the task. Based on Michael Crichton’s best-sel­ling novel, the film is set in a nearly completed theme park on a tropical island off the coast of South America. The mainattraction is no ordinary amusement park fide, but rather, genetically created dino­saurs. Long before the movie opened, audiences knew it was about dinosaurs. But we don’t get to see one until well into the story. Sam Neil plays a paleontologist, Jeff Goldblum a mathematician, and Laura Dern, a scientist whose skepticism about the existence of dinosaurs is put to rest when, in one of the movies most astonishing scenes, the three of them see a brontosaurus close up. While the special effects are amazing, the scale of the beasts is somehow altered, with visual perspecti­ves askew. But it’s easy to see why this Spielberg movie was such a box-office success. The small screen hardly dimini­shes the visual and technological effects of this blockbuster, which only needed a compelling screen-play to be regarded as superior. 1. Did the reviewer enjoy the film? 2. What didn’t the reviewer like about the film? 3. What faults did the reviewer find in the film? 4. What is according to the reviewer the reason of the box-office success of the film? Task 2Give a review of a film you have recently seen and liked (disliked). Use the topical vocabulary. Remember: A review should guide and inform. A mere tell­ing of the story is not a review. Listen to the following extract from the conversation between Hector Grant and John Martin. Fill in the spaces in the sentences below with the words actually used.